From the iconic images of Omayra Sanchez’s tragic death to the horrifying images of the Bhopal Gas disaster in 1984, the power of photography is still alive and invincible. Warning: Be prepared for images of violence and death (in one case, the photograph of a dead child) if you scroll down. 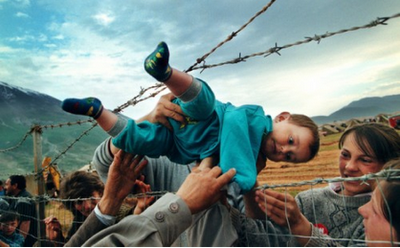 Carol Guzy, the first woman to receive a Pulitzer Prize for spot news photography, received her most recent Pulitzer in 2000 for her touching photographs of Kosovo refugees. The above picture portrays Agim Shala, a two-year-old boy, who is passed through a fence made with barbed wire to his family. Thousands of Kosovo refugees were reunited and camped in Kukes, Albania. Los Angeles Times photographer Carolyn Cole took this terrifying photo during her assignment in Liberia. 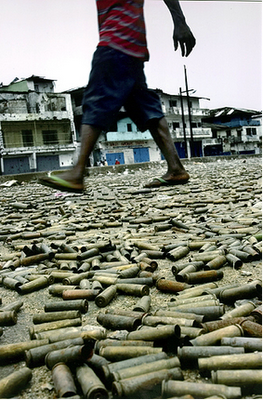 It shows the devastating effects of the Liberian Civil War. Bullet casings cover entirely a street in Monrovia. The Liberian capital was the worst affected region, because it was the scene of heavy fighting between government soldiers and rebel forces. Neal Ulevich won the 1977 Pulitzer Prize for a “series of photographs of disorder and brutality in the streets of Bangkok, Thailand” (Pulitzer.com). 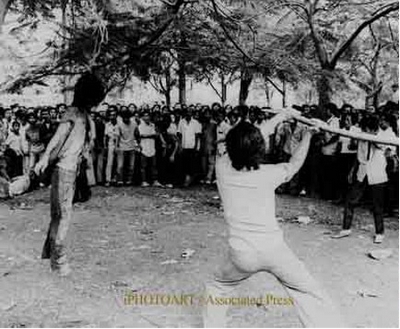 The Thammasat University Massacre took place on October 6, 1976. It was a very violent attack on students who were demonstrating against Field Marshall Thanom Kittikachorn. F. M. T. Kittikachorn was a dictator who was planning to come back to Thailand. The return of the military dictator from exile provoked very violent protests. Protestors and students were beaten, mutilated, shot, hung and burnt to death. Miami Herald photographer Patrick Farrell captured the harrowing images of the victims of Haiti in 2008. 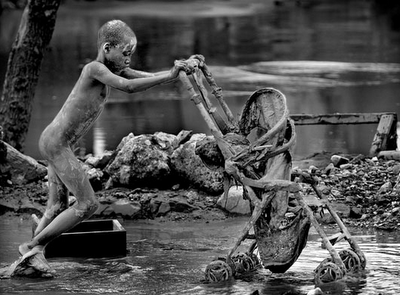 Farrell documented the Haitian tragedy with impressive black-and-white stills. The subject of “After the Storm” is a boy who is trying to save a stroller after the tropical storm Hanna struck Haiti. In 2006, Israeli authorities ordered the evacuation of illegal outposts, such as Amona. Oded Balilty, an Israeli photographer for the Associated Press, was present when the evacuation degenerated into violent and unprecedented clashes between settlers and police officers. The picture shows a brave woman rebelling against authorities. 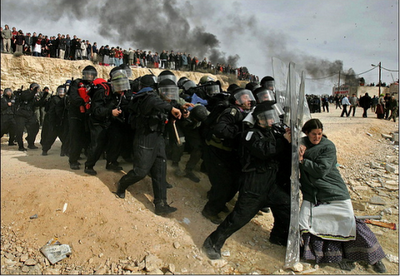 The power of Steve Ludlum’s photos are astounding, and the written description only tends to dilute the impact. 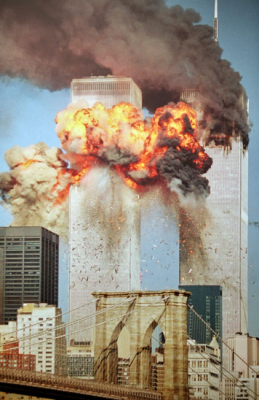 The consequences of the second aircraft crashing into New York’s WTC were devastating: fireballs erupted and smoke billowed from the skyscrapers anticipating the towers’ collapse and monstrous dust clouds. “After the Tsunami” illustrates an Indian woman lying on the sand with her arms outstretched, mourning a dead family member. Her relative was killed by one of the deadliest natural disasters that we have ever seen: the Indian Ocean tsunami. 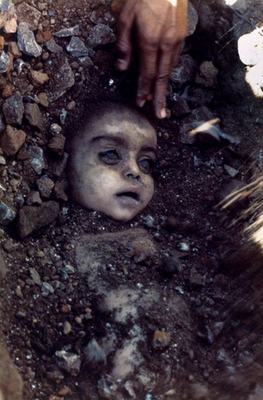 Pablo Bartholomew is an acclaimed Indian photojournalist who captured the Bhopal Gas Tragedy into his lens. Twenty-six years have passed since India’s worst industrial catastrophe injured 558,125 people and killed as many as 15,000. Because safety standards and maintenance procedures had been ignored at the Union Carbide India Limited (UCIL) pesticide plant in Bhopal, a leak of methyl isocyanate gas and other chemicals triggered a massive environmental and human disaster. Photographer Pablo Bartholomew rushed to document the catastrophe. He came across a man who was burying a child. This scene was photographed by both Pablo Bartholomew and Raghu Rai, another renowned Indian photojournalist. “This expression was so moving and so powerful to tell the whole story of the tragedy”, said Raghu Rai. 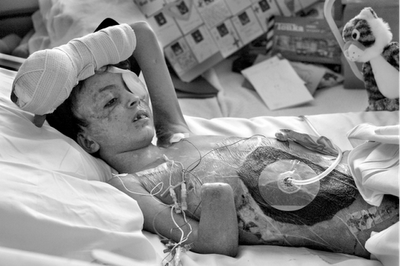 “Operation Lion Heart” is the story of a 9-year-old Iraqi boy who was severely injured by an explosion during one of the most violent conflicts of modern history – the Iraq War. The boy was brought to a hospital in Oakland, CA where he had to undergo dozens of life-and-death surgeries. His courage and unwillingness to die gave him the nickname: Saleh Khalaf, “Lion Heart”. Deanne Fitzmaurice’s shocking photographs ran in the San Francisco Chronicle in a five-part series written by Meredith May. Frank Fournier captured the tragic image of Omayra Sanchez trapped in mud and collapsed buildings. The eruption of the Nevado del Ruiz volcano in Colombia 1985 triggered a massive mudslide. It devastated towns and killed 25,000 people.